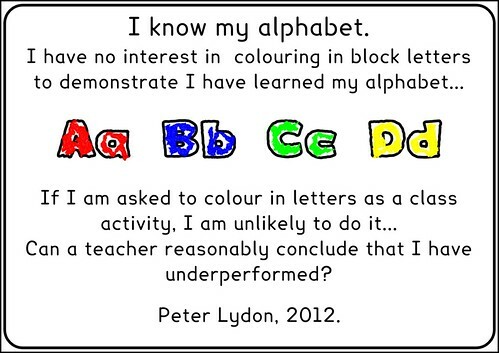 "A simple analogy; I know my alphabet; I have no interest in colouring in block letters to demonstrate I have learned my alphabet nor to do so as part of the alphabet-learning process; if I am asked to colour in letters as a class activity, I am unlikely to do it (unless coerced); can a teacher reasonably conclude that I have underperformed?" These are Peter's words on his blog at giftedandtalented.ie/index.php/2012/06/12/5-wonderings-on... . You'll notice I have omitted a few for this graphic medium.